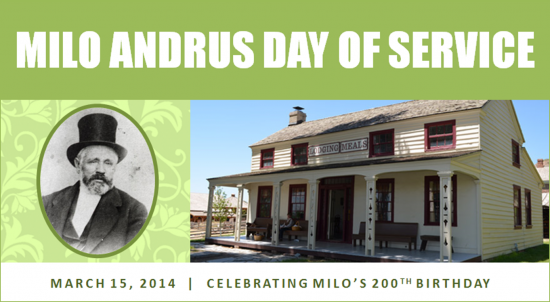 Milo was Born on March 14, 1814 — How Will You Celebrate His 200th Birthday? Milo Andrus left a legacy of service. Throughout his life he served his family, church and community. During the month of March 2014 we encourage you and your family to plan a day of service to benefit your family, church, or community. Take photos of your service project and share them with the Milo Andrus Family Organization (send them to webmaster@miloandrus.org). We will include your photos in the next family newsletter. In addition, you will probably want to bring coats, gloves, hats, etc. as it may be cold. Please RSVP for this activity by clicking here: http://whoozin.com/WUF-4AW-X7YG. Let us know how many people you will be bringing. Spread the Word! Pass this information on to anyone you think would like to come (kids, grandkids, cousins, etc.). Questions? Contact Russ Mathis: phone (801) 968-3779 or email russm1517@yahoo.com. I believe Milo was born on March 6, 1814.